Is NPR Fomenting A War With Iran? No. : NPR Public Editor NPR has been inundated by thousands of emails to correct a story that is said to assume that Iran is developing a nuclear weapon. The fear is that this is Iraq all over again. But in this case, there is nothing to correct. A look at the story and at Iran. Is NPR Fomenting A War With Iran? No. 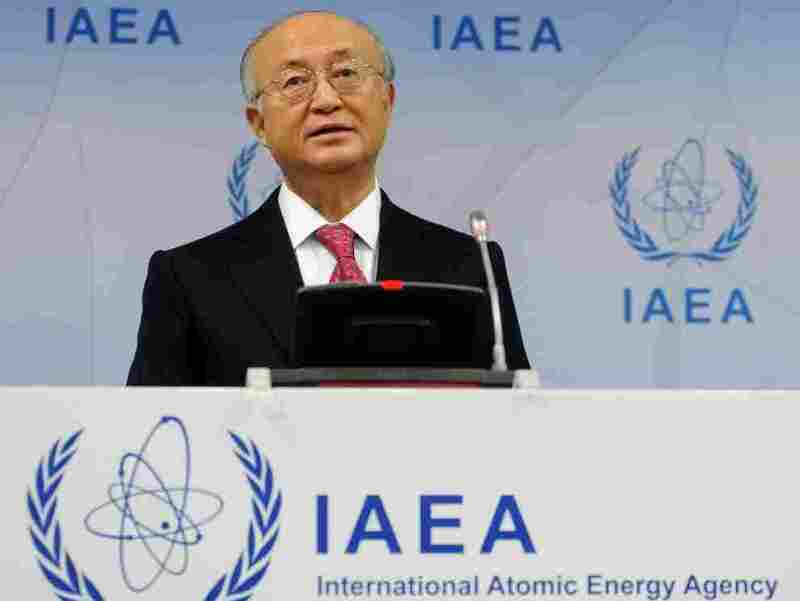 International Atomic Energy Agency (IAEA) Director-General Yukio Amano gives a press conference on Nov. 17, 2011. A report by the IAEA has been at the center of discussions about Iran's nuclear technology. Listeners are right to be vigilant about NPR and the news media coverage of Iran's nuclear program. A decade ago, much of the news media was intimidated and manipulated over a supposed nuclear weapons program in Iraq. The news media was hardly the only sector of society to be gullible, but the cost that we have had to pay in lives and money for such a catastrophic mistake has left us all on edge not to repeat it. The catastrophic mistake made a decade ago has left us all on edge not to repeat it. But the thousands of letters and phone calls that have poured into NPR in recent days about a story on Weekend Edition Sunday are finding phantoms in the other direction: the protesters are claiming things that NPR didn't say. Most of the letters were a form one drafted by Robert Naiman, the policy director for Just Foreign Policy, a small advocacy group based in Washington. The campaign was started in an opinion post by Naiman on The Huffington Post, in which he gave a link to the letter to send to NPR, asking for a correction. There is nothing to correct. The NPR story by national security reporter Tom Gjelten was about the escalating economic war of sorts between the United States and Iran. The focus was on how the current economic threats and sanctions have rebounds and consequences that are often unintended or counter-productive. It was a smart piece that stepped back to suggest that we all open our eyes to look at just what we are getting into as a result of what we are doing now. The story was about preventing Iran from having nuclear weapons, an assumption that it doesn't have one. The objection was to a line in the story in which Gjelten said: "And remember, the ultimate goal for the US and its allies is to convince Iran to give up a nuclear weapons program." Naiman wrote in Huffington Post that this statement was "thereby implying that Iran already has a nuclear weapons program, which is certainly not a known fact." The thousands of form letters received by NPR conclude: "I urge you to correct reporting that Iran has a nuclear weapons program and to take steps to prevent its recurrence." But the story didn't say or imply that Iran has a nuclear weapons program. As Bruce Auster, the senior editor for national security, notes, "The story was about how the sanctions are designed to prevent Iran from having a nuclear weapons program, which automatically suggests it may not have one." In other words, the quote cited by Naiman is taken out of context, and even that quote carefully refers to "a" program—using the indefinite article—and not the definite "its" or "the" program. The West wants to prevent Iran from developing a nuclear weapon. The plan, for now at least, is to use sanctions as pressure. The resulting economic pain might induce the Iranian regime to give up any thought of a weapons program. But international inspectors say Iran is getting closer to that nuclear capability. In mentioning international inspectors, Gjelten is referring to a report released in November by the International Atomic Energy Agency, the most authoritative public source we have at the moment. In it, the agency notes that Iran did have a nuclear weapons program up until 2003, stopped it, and now there is great uncertainty as to whether it has re-started it. The IAEA report says that Iran is carrying out "activities that are RELEVANT to the development of a nuclear explosive device" and that while some of those activities "have civilian as well as military applications, others are SPECIFIC to nuclear weapons." My emphases. All very Talmudic. It was the closest the UN agency had come to saying that Iran was engaged in a nuclear weapons program, but still stopped short of saying that the country actually had one. The NPR story in wording and in tone accurately reflected this position. Even to refer to Iran's 'nuclear program' is warmongering to some listeners. But it would be a worse offense to pretend it does not exist. Shorthand references are often dangerous in journalism, and listeners are correct to be on the alert for them. Repeated enough as fact—"Iran's nuclear weapons program"—they take on a life of their own. According to Auster, NPR's policy is to refer in shorthand to Iran's "nuclear program" and not "nuclear weapons program." This is a correct formula, it seems to me, in part because Iran has proudly announced its nuclear program—while asserting it is for "peaceful" purposes, not for making weapons. For a complete, level-headed analysis of the IAEA report, readers might want to go back to a segment by NPR Mike Shuster the day it was released. Even to refer to Iran's "nuclear program" is warmongering to some listeners. The worse offense, however, would be to pretend that the program does not exist, or that a threat is not there. Many of us probably took heart last Sunday when Defense Secretary Leon Panetta said flatly on Face the Nation of Iran: "Are they trying to develop a nuclear weapon? No." He appears to have gone further than the official US government position, however. In denying that the US had a role in the assassination this week of an Iranian nuclear scientist, Secretary of State Hillary Clinton encouraged Iran to "end its search for nuclear weapons." This says that the US government believes Iran is at least searching. The form letters to NPR note that The New York Times removed a paragraph from one of its Iran stories and The Washington Post changed an online headline on a photo gallery. This is true, but the shorthand references in those papers were different from NPR's. The Times, in a story on European sanctions of Iran, had written in the removed paragraph that "Iran's nuclear program has a military objective," according to the paper's ombudsman, Arthur Brisbane. The original Post headline was: "Iran's quest to possess nuclear weapons." The Post later changed the headline to nuclear 'technology'. This issue and the sensitivity on how to report it is not likely to go away any time soon. For further reading on how the whole issue is seen from inside Iran, I recommend reading Hooman Majd's "Christmas is No Time for an Iranian Revolution" in this week in Foreign Affairs. Meanwhile, please stay vigilant and let me know when you think I am missing something.